Range Rover has recorded a tremendous success with its new compact SUV, Range Rover Evoque. The car’s first lot was sold ahead of its arrival. Later the car was launched in Mumbai at a price of Rs. 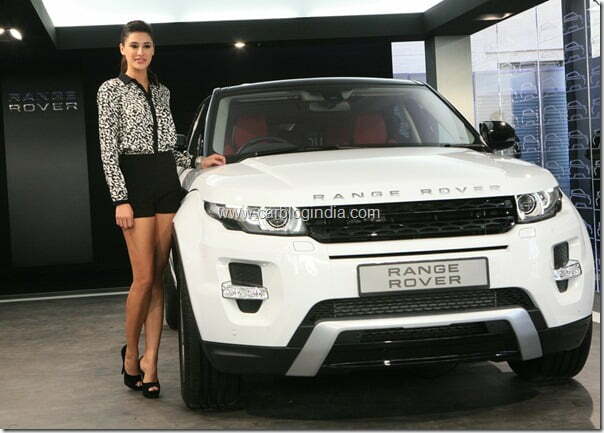 44.75 Lakhs and also came to Delhi on 18th November where actress Nargis Fakhri unveiled the same. The overwhelming response touched Land Rover so much that now they are planning to introduce a bigger version of Evoque. To be named as Grand Evoque or Evoque XL the car will feature an 12 inch longer wheelbase and will be positioned between the mid-range Evoque and base Range Rover Sport. The design cues of the Grand Evoque will be in similarity with the launched Evoque but the whether the extended wheelbase version will affect the sales of the normal version or not, remains a question. The Grand Evoque is one of the 40 new cars the company washes to introduce in the next 5 years. The Evoque XL will go against BMW X5, Mercedes M Class and Audi Q7. As on the technical front, the car is speculated to equip a 1.8 Liter MPFI petrol engine delivering 170 BHP while a CRDI diesel engine will also come soon. Besides these two engines a Hybrid version is also said to be planned for the market. The bigger Evoque will be super light owing to the materials used and will be manufactured in UK at the same facility where the current Evoque is built.